Click HERE to see all of the new Subaru products. Following a successful launch into the AWD market with the Mitsubishi Evolution VIII / IX / X product line, it was only natural to progress to the EVO's arch nemesis, the Subaru Impreza WRX STi. We have been producing Subaru BRZ boxer fuel rails (shown below) for some time with great feedback, so we had a solid base to build on. Radium Engineering has just released a family of fuel rails and related accessories for the popular Subaru boxer engines. Two fuel rail kits cover models from 2002 to 2015. The first kit is targeted at the Subaru engines that are equipped with side-feed injectors from the factory. It is well known that tuners prefer top-feed injectors for the cost and vast selection. 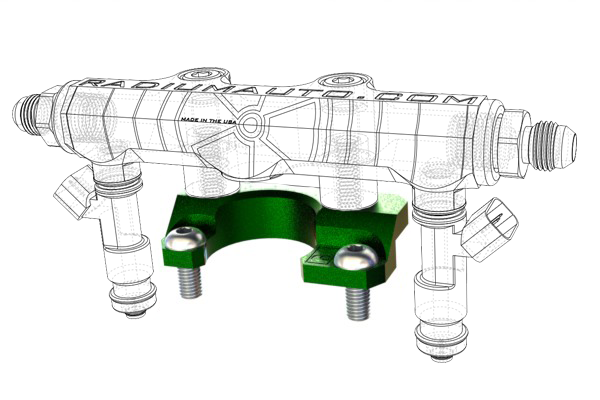 The Radium Engineering conversion fuel rail kit (shown above) utilizes specially machined injector seats that insert into the fuel injector bores on the TGV housings. These allow the use of top feed injectors in a clean and leak-free package. More information on these injector seats is shown below. Different height injectors can be accomodated simply by swapping out the insulating mounting boss spacers that are included with the kit. Injector compatibility is explained more below and also on the product page HERE. The other fuel rail kit is a perfect bolt-in option for Subaru engines that originally came equipped with top feed injectors. It can also accomodate different height injectors by swapping out the insulating mounting boss spacers included in the kit. More information on this fuel rail kit can be found HERE. Both kits utilize fuel rails that are machined from 6061 aluminum and followed up with bright dipped black anodizing and laser engraving. Each fuel rail is equipped with three 3/8" NPT ports (one on each end and one on the bottom). This allows the rails to be plumbed in a wide variety of configurations. More information on plumbing the fuel rails can be found on the product pages in the "More Details" tab. Why Radium Engineering Fuel Rails? These fuel rail kits cover a large range of Subaru vehicles that go all the way back 13 years. There are dozens of aftermarket fuel rail kits currently available. So you ask, "Why spend time developing products in a saturated market?" Well quite honestly we found a few areas that can be improved. More than any other engine, the Subaru's horizontally opposed 4 cylinder is extremely vulnerable to poor fuel delivery. The most common symptom is the lean spike stumble seen on many applications. Like all Radium Engineering fuel rail kits, we are the only to offer an optional integrated fuel pulse damper. Many manufacturers skip on this vital piece with the assumption that large bore rails are not suseptable to the issue. However, gas is not compressible. The opening and closing of the injectors creates pressure pulses in the fuel rail which can lead to unstable fuel pressure. In order to achieve a safe and consistent rail pressure, a pulse damper should be used (especially with high flow injectors). The internal diaphragm absorbs oscillating pulses and helps stabilize fuel pressure. This correction can be measured throughout the RPM range and can often help an erratic surging idle. The fuel pulse damper (shown below in center port) can be used in any of the three 3/8" NPT ports on the Subaru fuel rails. The restrictive 0.19" (4.8mm) ID OEM cross-over fuel piping can also contribute to fuel pressure issues. With excess fuel demands from larger turbochargers, this problem only gets worse. The Radium kit comes with four -6AN fittings for large 3/8" (9.5mm) hose and can be configured in parallel (depicted below) which many Subaru tuners are convinced is essential for the Subaru fuel system. Many other plumbing methods can be used as well (series, parallel, dead end, etc). Taking every last measure to reduce heat input into the fuel system, machined phenolic mounting spacers and washers are included to completely isolate the fuel rail from heat transferred from the TGV housings and mounting bolts. Two sets of these press-fit phenolic spacers (8 total) and matching hardware are included in this kit to suit different height fuel injectors. The kit is designed for specific injector heights for proper fitment. Upper and lower O-ring spacing requirements are depicted below for the Top Feed Upgrade Kit. The 20-0168 Top Feed Conversion Kit also comes with 14mm injector bore billet injector seats. These actually snap into place and seal with Viton O-rings. They are anodized and laser etched for a long lasting surface finish. They can be purchased separately HERE . For the owner of the less common Version 8/9 JDM STi intake manifold that does not use TGV housings, we have a 20-0172 Billet Adapter Kit that allows for the use of our top feed fuel rail upgrade kit. As previously mentioned, all 3 ports of each fuel rail are tapped with 3/8" NPT. This allows for the use of our billet FPR adapter if an OEM fuel pressure regulator is used. 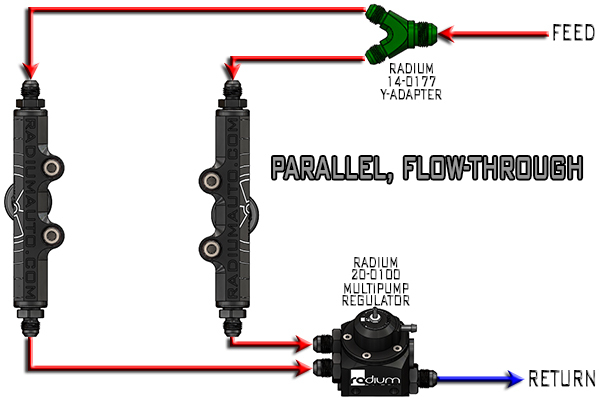 Click to see all of the new RADIUM products for the Subaru Impreza WRX, Impreza STi, Legacy GT, and Forester XT.